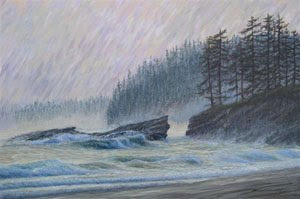 In the winter of 07 the West Coast Trail on Vancouver Island was hammered by two back to back storms that brought down trees, and washed out large sections of the trail. When spring rolled around Parks Canada had to close the trail just so crews could get in and clean up the mess. With no one on the trail it would have been an ideal time for a kayak tour along the coast. Bamfield down to Port Renfrew in three or four days would have been ideal. With that in mind I wrote to Parks Canada, outlined my plan and volunteered to prepay the camping fees. The e mail I got back said kayakers were not allowed to land and camp along the trail. That struck me as rather ironic. The trail opened to save mariners was no longer open to mariners - unless I supposed I wrecked my kayak upon landing. Always a possibility on that part of the west coast. The letter went on to encourage me to kayak/camp in the Broken Group. No thanks. I soloed around Cape Flattery instead. I'm not easily discourage so this year a second e mail solicited a much more positive response. The trail is open to kayakers and always has been. The first e mail seemed to have been over zealous. Parks Canada's concern is that the route not become so popular as to attract novice, beginners, or those intermediate kayakers who have been around for years but have somehow failed to advance their skills, knowledge and judgement. Barb Brittain Communications Coordinator with the Pacific Rim National Park Reserve Wrote"We see very few kayakers along the West Coast Trail due in part to the very exposed nature of the coastline with relatively long stretches devoid of landing locations and the high percentage of surf landings where kayaks can come to shore. In short the West Coast Trail is a stretch of coastline that only very skilled kayakers should consider." I count those as very wise words. Most kayakers circumnavigating Vancouver Island do this section of the West Coast with only one overnight along the trail. They slip ashore late in the evening and are gone early the next day. As the trail is so close to the finish point in Victoria it gets short shifted by kayakers who have to put in long days and cover lots of water to complete their journey. If you plan to paddle and explore this coast Parks Canada would very much like kayakers to purchase an over night use permit. In fact they require it. The permit cost $127.50. The hiking fee is $166.00 and includes two ferry rides. One at either end. There's no waiting list if you plan to kayak. The permit can be obtained at either trail head. Payment is taken when the permit is issued. All hikers go through an orientation session with prior notice staff can modify a presentation to address the points that would be relevant to kayakers. Having paddled that section last summer, I would echo the words of Barb Brittain. However, it is an amazing stretch of coast to paddle if conditions permit. It is good to see the info and contacts posted.